The following article is meant to represent three popular scenarios as comprehensively as possible, and does not necessarily reflect personal views. As the majority of the article was written before the release of Spirit Tracks, any information relating to the game may be speculation, and not fact. The cryptic ending of Phantom Hourglass is one of the more confusing and controversial closing scenes in The Legend of Zelda series. A multitude of mysterious clues leaves the gamer wondering exactly what has just been witnessed. The game itself takes place on a series of islands in a territory protected by the Ocean King. In the introduction, Link, Tetra, and their pirate crew are sailing the seas some months after the events of The Wind Waker. Some of the crew fear the waters into which they are sailing, as rumors of a Ghost Ship haunting the land have reached their ears. Tetra, on the other hand, wants to press on, certain that the Ghost Ship is nothing more than fraudulent pirates up to no good. Much to her surprise, the Ghost Ship soon appears on the horizon. Tetra and Link both attempt to board, but Link falls overboard, and the Ghost Ship sails off with Tetra aboard. When Link awakens, he has washed upon the shore of Mercay Island, and his quest to find Tetra begins. With the help of Ciela, the Fairy, Oshus, a wise old man, and a pirate named Linebeck, Link sets out. Along the way, Link learns that the Ghost Ship, as well as the monsters that haunt the islands, are the product of an evil monster known as Bellum. With his evil power, he sealed away the Ocean King and drained his Life Force. Luring more souls to his corrupted waters with rumors of treasure, Bellum used the Ghost Ship to steal their Life Force as well. Upon defeating Bellum, destroying the Ghost Ship, and restoring the stolen Force in the form of the Sand of Hours to Oshus, his true form, that of the Ocean King, is revealed. Oshus grants Linebeck his wish to have his ship, a casualty of the epic clash with Bellum, restored to him, and then reassures Link and Tetra the Ghost Ship will no longer haunt “your world”. Just as many theorists are puzzled by this statement, Tetra and Link don’t comprehend what Oshus means by it. Instead of revealing the mystery, Oshus only reiterates, and tells them that the door to their world is about to open. Though Ciela, the recently awakened Spirit of Time and Courage, wishes to remain with Link, she insists that she must return to the world of the Ocean King. Link and Tetra soon awaken and find themselves on the Ghost Ship, which shows no sign of the damage it took in the battle with Bellum. Tetra, in a state of confusion, demands that her crew explain why they didn’t come looking for her. Much to her disbelief, the pirates assure her that she and Link were only gone ten minutes. As Tetra argues the impossibility of this, the Ghost Ship disappears, just as mysteriously as it had appeared in the first place, leaving Link and Tetra to question whether their experiences were real or not. Keeping true to the mysterious nature of the game, in the final seconds, Link spies Linebeck sailing off in the distance, newly restored ship and all, and also discovers the now empty Phantom Hourglass in his pocket. In this jumbled mess of seemingly contradicting hints as to what really happened, many different theories arise. Each one seems to take certain “symbolic liberties”, rely on other lesser theories, and to an extent, clash with other indications. No one can truly claim their interpretation is concrete. Of the many different views and interpretations, three basic theories have proven to be the most accepted ones in the theorizing community. The first theory states that the events of Phantom Hourglass were actually a dream, not unlike Link’s Awakening. The second theory holds that the events of Phantom Hourglass were not only real, but actually took place somewhere in the Great Sea of Hyrule. Finally, in the third theory, the Realm of the Ocean King is a parallel dimension to Hyrule, in a similar fashion to the land of Termina in Majora’s Mask. While different conclusions may be drawn about what each piece of evidence means, most theorists will eventually settle on one of those three scenarios as the likely answer. In order to explain these theories more thoroughly, three well-known names in the Zelda Theorizing community will offer explanations. Ben Lamoreux (Erimgard), Tanner D’Amato (Skylark) and Dan Merrill (Hylian Dan), will each explore one of the three possibilities, and contrast them against the others. Link felt all his hope vanish as the waves crashed over him underneath the dark and ominous sky. The water enveloped him, as he slipped into unconsciousness, leaving him to the mercy of the sea. When all seemed lost, a friendly voice beckoned him, and he awoke to find himself on the shores of an unknown island. No, I’m not talking the beginning of Phantom Hourglass and Mercay Island, but rather the opening moments of Link’s Awakening on the island of Koholint. These two stories resonate with similarities that defy coincidence, and the parallels certainly don’t end with the opening sequences of the two games. In both games Link is drawn to a new realm by a disaster at sea, and remains there on a quest to save the guardian deity of the watery domain. While Link’s Awakening depicts his quest to awaken the Wind Fish, Phantom Hourglass shows his heroic efforts in releasing the Ocean King from his dark imprisonment. Just how far do these parallels go, and how literal is the connection? The games themselves hold the clues. In Link’s Awakening, the island of Koholint, and all its inhabitants, are but a dream or illusion. As Link learns on his travels, a guardian deity known as the Wind Fish has the power to manifest his dreams into reality. The dreams of the Wind Fish are not only real to him, but become real to all those around him. The Wind Fish first dreams an egg around himself, a protective shell, and from there, dreams a mountain upon which the egg rests, and an island for the mountain to tower over. From his slumber, the Wind Fish produces all manner of living beings to inhabit the island; an entire civilization created from the subconscious thoughts of a deity. This manifestation is so real, that when Link, an outsider who was not the product of the dreams of the Wind Fish, is lost at sea, the island is real, to an extent, to him as well. When Link lost consciousness after his boat was struck by lightning, he “awoke” on the shores of Koholint island. Though everything on the island was real to him, to the extent that he could actually be hurt or killed by the dangerous monsters that lurked on the island, as an outsider, Link was dreaming as well. Throughout his adventures on the island, Link encountered many familiar faces. Marin, for example, heavily reminds Link of Princess Zelda. These familiar faces were not the product of the dreams of the Wind Fish, but rather Link’s own mind. One inhabitant of the island actually informs Link that the monsters began appearing on the island around the same time of his arrival. The Wind Fish had not manifested these creatures upon its peaceful habitat, Link had, through the memories of his past wars against evil. The Wind Fish from Link’s Awakening. Yet strangely, the Moblins already had a well-established hideout on the island. If the Wind Fish had not dreamt the monsters into existence, then he certainly hadn’t dreamt them a home. This too was the product of Link’s dreams, showing that with a simple subconscious thought, this dream world could be affected even to the extent of creating buildings that appear to have stood for some time. 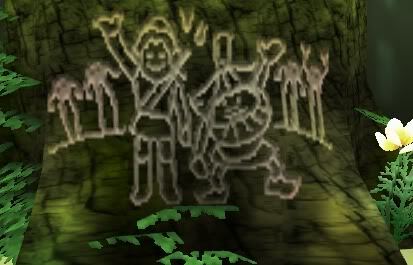 The very history of the island was altered upon Link’s entry. Though this may seem strange, the islanders wouldn’t be alarmed by this apparent alteration of history, as time was a concept unheard of on Koholint. While the thoughts of Link upon his entry into the island affect it, he cannot end the dream by himself. Only by awakening the Wind Fish will the dream end. As Link learns throughout his quest, it is only by awakening the Wind Fish that he can leave the island, but doing so will cause the island to cease to exist, along with all of its inhabitants. Only one islander, Marin, seems interested in what’s beyond the island. Link presses on in his quest to awaken the Wind Fish, though he knows it will mean the end for all the friends he has made on Koholint. Throughout his journey, Link is aided by an owl, who gives warnings to him of dangers ahead, encourages him, and tells him of the places he must travel. Near the end of the game, the mysterious owl reveals the source of his wisdom, and his reason for guiding Link. It seems the Wind Fish literally split a piece of his soul off to set it apart as the guardian of the island, keeping watch over his creations. The owl reveals to Link that he trusted in Link from the start, believing he came to the island to rescue it. The once peaceful sleep of the Wind Fish had become disturbed by the intrusion of dark forces known as the Nightmares. Upon entry into Koholint, they, presumably through some dark magic, made the Wind Fish’s sleep eternal, and set out to conquer his dreams. Exactly who the Nightmares are, and how they entered the Wind Fish’s dreams is unknown, but they too were influenced by the subconscious thoughts of Link. Manifesting themselves as previous foes, such as Aganhim and Ganon, they fought against Link. Upon being dealt the final blow, the Nightmares spoke their last before vanishing. The dream was so real to the Nightmares that they considered it to be a real world. A world which they intended to make their own. As long as they trapped the Wind Fish in an eternal sleep, the world was real. With the Nightmares defeated, Link was ready to complete his task. The owl fades away into the background, presumably returning its spirit to the Wind Fish. The Wind Fish appears in front of Link, although apparently not awakened, and explains the truth of the island’s existence being all part of his dream. Finally he beckons Link to join him in awakening. Echoing the fact that Link, too, had contributed to the dream, the Wind Fish was prepared to erase the world it had created to allow Link to return home. Link plays the eight instruments that he collected throughout the game, and the Wind Fish awakens as promised. As the island vanished, as if it had never been there, Link finds himself back on the wreckage of his destroyed ship, as though he had never left. Just as a very dazed Link is likely questioning where the line between reality and imagination ends, a smile comes to his face as he sees the Wind Fish fly off in the distance, letting him know something was real. To those talented enough to complete the game without losing any lives, an extended, true ending occurs. As Koholint disappears forever, along with all of its inhabitants, an image of Marin appears before Link’s eyes. Just as she had wished to the Wind Fish, the image transforms into a seagull, and Marin flies away. After washing up on the shores of Mercay Island, Link’s efforts are initially just part of a quest to rescue Tetra, but he soon becomes much more involved in the World of the Ocean King. Learning of the Ocean King’s imprisonment at the hands of the evil Bellum, Link endeavors to rescue not only Zelda, but the Ocean King as well. Along his voyage, Link runs into many familiar faces, reminiscent of people he met during the events of The Wind Waker. Oshus is the spitting image of Orca, an old swordsman who trains Link The Wind Waker. Beedle, the sailing merchant, has a counterpart with the same name and occupation. There’s even a parallel to Link himself. A self-proclaimed “Hero” rides around on a ship called the Prince of Red Lions, an obvious reference to Link and the King of Red Lions from Wind Waker. Just as characters from Koholint such as Marin and Tarin were the products of Link’s dreams and memories brought to life by the Wind Fish, it would seem that many of the inhabitants of the World of the Ocean King were also dreamt up by Link himself. Link’s manifested memories may include not just people, but an entire culture. While exploring the Northeastern Sea, Link discovers a lost civilization known as the Cobble Kingdom. On the Isle of Death in the Cobble Kingdom, Link finds the graves of six sages, reminiscent of the Six Sages of Hylian lore. Later, Link discovers the Isle of Ruins, also a part of the Cobble Kingdom. In order to access much of this island, he has to drain the water away, as most of the kingdom has become submerged, just as Hyrule Kingdom itself was lost beneath the depths of the sea. It’s quite possible that this entire civilization was influenced by Link’s mental picture of the submerged Hyrule which he visited in The Wind Waker. Near the midpoint of the game Link boards the notorious Ghost Ship, and finds that Tetra has been turned to stone. While Link is still reeling from this shock, Oshus appears and reveals the truth to Link. When Bellum attacked the Ocean King and sealed him away, he had only one choice. Splitting his soul in half, he created a “clone” outside of the seal who could study his enemy and wait for the moment to strike. That clone was Oshus himself. In Link’s Awakening the Wind Fish was “sealed” inside of his dreams, preventing him from waking up and freeing himself from the evils of the Nightmares. Just as he split his soul to create the wise old owl to escape the seal and guide Link on his journeys, the Ocean King split his soul to escape his seal and guide Link in his fight against Bellum. After restoring Tetra and freeing her from her stony imprisonment, she makes a strange revelation. While on the Ghost Ship, the apparent connection point between the real world and the World of the Ocean King, Tetra was dreaming, and her dreams were that of Link’s quest. 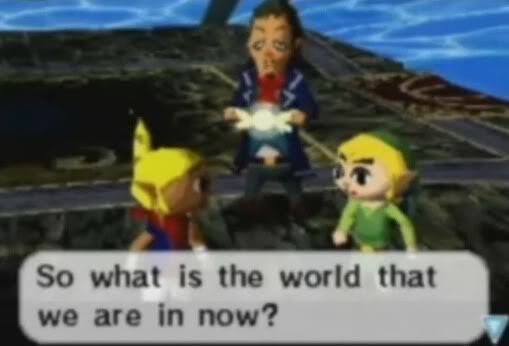 Whether Tetra’s dreams directly affected the World of the Ocean King or not is debatable, but there is a definite connection between the power of the subconscious mind and the happenings of Phantom Hourglass. The Ocean King restored to his full power. After Bellum’s defeat, the life force he stole from the Ocean King is returned, and his true form is revealed. 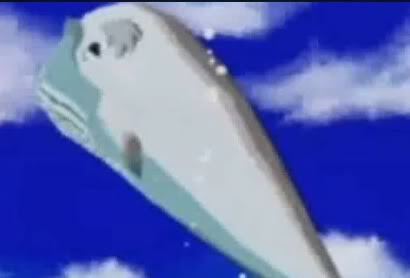 Just like the Wind Fish, this deity’s true identity is that of a whale. In the closing moments of Link’s time in this strange world, the Ocean King agrees to grant Linebeck’s wish for his ship to be restored, and tells Link he must return to his world through a door that is about to open. Link had been on the Ghost Ship earlier, and no such door back to his world had existed, so why was there now an apparent portal between the two worlds? The answer again lies in Link’s Awakening. Just as Link was able to enter Koholint through the sea, but couldn’t leave without the power of the awakened Wind Fish, Link could enter the World of the Ocean King through the Ghost Ship, but he could not exit the realm without the power of the Ocean King; another indication that the world only existed through the Ocean King’s influence. Back in their own world again, it seems as though Link and Tetra were only gone ten minutes. While Tetra scoffs at the thought of it, the other pirates’ suggestion that it was all just a dream seems the most likely solution to the strange events. While Tetra debates this with the other pirates, Link sees Linebeck sailing off in his newly restored ship. Just as Marin was granted her wish, and was able to escape the dream world of Koholint, Linebeck was also granted his wish, and was able to sail the seas outside of the Ocean King’s influence. Finally, the restored Ghost Ship, the only known link between the Ocean King’s world and the real world, vanishes from sight as if it had never been there at all, much like a dream. Just as Koholint itself vanished, the only entry point to the World of the Ocean King disappeared without a trace. The Ocean King himself was a real deity who existed in the real world, but his world, the realm in which Phantom Hourglass occurs, was only real to those under the influence of the Ocean King’s power and the dreams of Link and Tetra. Like Koholint, it was a dream world. The ending of Phantom Hourglass leaves many questions unanswered, requiring the player to figure out the truth of the events that transpired themselves. Without any prior knowledge of the series, a player might assume the game’s storyline is a dream, or an alternate reality. Both of which are proposed by the Ocean King’s exit, and Tetra when her and Link awaken. However, The Legend of Zelda has a very strong history of time travel. The evidence of it occurring in Phantom Hourglass is well hidden, but very quickly adds up. Ciela, the Sand of Hours, and a few Wind Waker references link the Ocean King’s Sea to the Great Sea through more than just the Ghost Ship. Even myths of the Ocean King have reached the pirates ears. This helps establish that the Ocean King is at least a myth in the Great Sea. The crew knows of him, and his domain. So, even if his realm is an alternate world, it must be somewhat traveled. Furthermore, The Isle of Frost seems to make some slight references to The Wind Waker. Zunari, a merchant on Windfall Island claims to have come from a far away island, where life is harsh and cold. His Eskimo like attire looks almost identical to the Anouki, one of the two races of the island. The only option is that the events took place in a far off location from the Great Sea of The Wind Waker, and that the Ocean King somehow returned Link, Tetra, and Linebeck all to the starting point only ten minutes after the Ghost ship incident. Upon learning Ciela’s true identity, Link also learns that she is the spirit of Courage and Time. With the Phantom Hourglass alone she has the ability to stop time. This opens up the possibility that the means to time travel are available to Link and his company. More control over time is mentioned through references of the Ocean King himself. Twice the Ocean King is grouped with the Sand of Hours and the Phantom Hourglass, both of which are used in the slight control of time. It also gives us the sand’s origin. It is made up of Force gems, the life force of the Ocean King himself. It is also stated that he used the sand, his life force, to create the hourglass. The Ocean King is the source of the spirits’ powers as well. After he had split his soul, they had all weakened in power, and were captured. Given that Ciela has power over time, it is safe to assume the one that grants her such power has control as well. In game we only get to use this power to delay the effects of draining Link’s life force, as well as stopping time for a short duration. However, we never use this ability during game play after the Ocean King is rescued and has all of his power restored. We do know, however, that he was able to create the powerful Hourglass in his weakened state. But, if The Ocean King could just travel through time, why could he not defeat Bellum? Of course The Ocean King is not all knowing, as he did not see the attacks coming. Yet, what prevented him from returning to before the fight and ending it there? While there is no given reason for why The Ocean King lost, it is stated that Bellum was surprising always one step ahead. Every time the two clashed, Bellum would absorb some of the Ocean King’s life force. Even time jumping would not restore it, as he had already lost it. So, every conflict with the monster left him weaker than the last. Eventually he lost, having to resort to splitting his soul to escape. Bellum sealed the Ocean King away, and used his power to create monsters to imprison the spirits. These beasts were born from the Ocean King’s life force, as they returned to Sand of Hours when defeated. The ending still gives the vibe that the Ocean King’s Sea is a world different from that of Link’s. However, just as the Ocean King starts mentioning the separate worlds, a thick fog starts to envelop the characters. The Ocean King and the spirits then start to depart in the middle of the fog, claiming to return to their world, Ciela seems to just fade out of existence. This leads me to believe that they are in or bordering the spirit world, or rather the Ocean King’s home, where he resides and watches his sea. Fog begins to appear around Link, Linebeck and Tetra. Link then awakens and finds Tetra and himself back on the ghost ship. The ship waits for them to be safely back to their own vessel before vanishing. The ghost ship throughout the game is connected with spirits and their domain, once again enforcing the fog as some sort of sign. Then why does it vanish after they returned from the end of their adventure? The fact that the ghost ship was there implies that Bellum caught the Ocean King, stole his life force, and then created the ship to steal more from mortals. However, we see it vanish right away, implying that Bellum was defeated. This can lead to two things. The Ghost Ship was a focal point to where The Great Sea and the Ocean King’s world meet, and that the two exist on different scales of time, or that the Ocean King and spirits themselves exist outside of it, as they can manipulate and escape it willingly. As proven by the creation of the hourglass and Sand of Hours, as well as Ciela’s abilities. The problem with the first option is that the Great Sea should not know of the Ocean King, only the rumors of the Ghost Ship. As anyone who goes on to spread such tales gets their life force stolen, no one could survive the journey. However, option two has some credibility, as we know the Ocean King and Ciela have such powers. The only question is how does this form of time travel function? Does sending Link and Tetra back 10 minutes after they boarded the Ghost ship replace their earlier incarnations, or does it open a paradox where there are two copies of each? Having duplicates would explain why the pirates never search for them. However, the Ghost ship vanishing for good would prevent Link from completing his quest, thus breaking the chain. So we must assume that they are replaced, as to keep the original series of event in place. The only other option is to assume the Ghost ship is unaffected by time, and defeating Bellum at “any when” will make it lose its power, as it was created by the life force of the Ocean King, the now saved King unmakes it. The ending of Phantom Hourglass seems to add more questions with each answer. However, while Link still holds the main item from his quest, Tetra shares his memories, and Linebeck’s ship can be seen. We know that these events truly did transpire. The knowledge of Ocean King rumors, and the rules set by the Ghost ship prevent anyone to travel between worlds to spread them, so there must be some travel between the two seas. While time travel may be confusing, as well as add many more questions to the enigma that Phantom Hourglass calls an ending, it has a strong history within the franchise, as well as being hinted at with the Sand of Hours, and the Hourglass itself. The ending to Phantom Hourglass is ambiguous, plain and simple. The game makes no real attempt to explain what exactly occurred, basically leaving it to the player to come to a conclusion. I don’t think the ending can be explained by simply examining Phantom Hourglass on its own. There’s not enough information available to reach a strong conclusion. I’m going to try to address the matter of the game’s ending by placing it within the larger context of the Zelda series, showing how it relates to other endings in the series as well as the grand themes underlying everything. Ultimately, I’m also going to explain why I lean towards the idea that Phantom Hourglass took place in a parallel dimension. To begin with, there is one theme in particular at the root of The Legend of Zelda: memory. The original Zelda game was inspired by Mr. Miyamoto’s childhood, when he would explore the forests, lakes, and caves surrounding his hometown, Sonobe. That childhood world is no longer accessible to Mr. Miyamoto – he’s moved on and embraced adulthood. Even if he were to return and explore that region again, he would not likely feel the same magical sense of wonder and mystery that he once felt as a boy. It would be like replaying a Zelda game – an intangible part of the experience is gone forever, because a memory of it has already been formed. At its essence, The Legend of Zelda series is an adult’s memories of a beautiful world that no longer exists. That’s why it is called a legend – a story handed down from earlier times. Link’s Awakening was the first installment of the series to incorporate this meaning as an actual part of the storyline. At its ending, Link prepares to depart from the magical paradise of Koholint Island, knowing that the island will soon cease to exist and he will never be able to return. 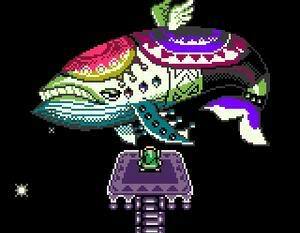 The Wind Fish tells Link to hold on to the memory of Koholint, for it is the memory – not the actual island – that is real. Since then, the Zelda games have often concluded with Link moving on and leaving something beautiful behind. In Ocarina of Time, destiny separates Link from the friends he’s found, and he must say good-bye to the people he loves. When he returns to his childhood world, his great quest to stop Ganondorf exists only as a memory. Everyone else is unaware of the existence of the separate timeline, and Link knows he is forever separated from that world. Majora’s Mask builds on the story of Link’s Awakening, taking place in the parallel world Termina. While Koholint is a dream world filled with imaginary characters, Termina is presented as a real place with real people leading real lives. Link changes the destiny of Termina so that it may continue to exist, but in the end he still leaves this world behind. He returns to Hyrule and carves a picture of Termina into a tree stump – for Link, Termina has transformed into a memory. Link’s drawn memory of a world left behind: Termina. The Wind Waker concludes after the King of Hyrule decides to let his kingdom come to a final, irreversible ending. Afterwards, Link and Tetra realize that they must also leave behind the world that they know. They say goodbye to Outset Island and the familiar regions of the Great Sea, setting out in search of a new land. And so, the ambiguous ending of Phantom Hourglass can easily be understood as a continuation of this theme. Link leaves behind the world that he’s gotten to know so that it exists for him only as a memory. That’s the main significance of the ending, regardless of the actual nature of the Ocean King’s world. What kind of world did Phantom Hourglass take place in? Was it a dream world that would cease to exist once Link departed, as was Koholint in Link’s Awakening? Was it a separate timeline that would continue to exist after Link was sent back in time, as was the adult world in Ocarina of Time? Was it a parallel world that would continue to exist in a separate dimension, as was Termina in Majora’s Mask? Or was it simply a physical location that Link left behind, as was Outset Island in The Wind Waker? The Wind Waker-style ending can be ruled out, as the ending of Phantom Hourglass makes it clear that something strange is going on. I feel the Majora’s Mask ending is the one that can be applied the most effectively. Like Termina, the world of the Ocean King seems very much to be a real place with real people. They’re not imaginary beings inhabiting a timeless world, as are the people of Koholint. Like Termina, the Ocean King’s world has a history – Termina has the fallen kingdom of Ikana, and the Ocean King’s world has the fallen Cobble Kingdom. Nothing in the game seems to indicate that the Ocean King’s world will cease to exist when Link leaves it behind, as was the case with Koholint. The Ocean King’s world will continue in an alternate dimension of its own. But again, the important thing to note about Phantom Hourglass’s ending is the manner in which it continues to express the underlying themes of The Legend of Zelda. Zelda questions the nature of the reality we’re familiar with: eventually, our experience of the world we know will end. As Sheik explains with beautiful simplicity, “Time passes, people move.” Is the surrounding world only as real as Koholint Island: a bubble about to be burst? When we leave behind a world, does that world remain real? That’s one of the key questions posed by The Legend of Zelda. Perhaps Phantom Hourglass leaves things ambiguous because the answer to that question is also ambiguous. Whatever the real nature of the Ocean King’s world is, in the end it exists as a legend that will be passed down by Link and Tetra. While Tanner is correct in his conclusion that the Ocean King is known outside of the realm of Phantom Hourglass, this does not cement the location of the World of the Ocean King as being part of the Great Sea. Link’s Awakening shows us that a sea deity can exist in the literal ocean, but have their domain exist only as an extension of their power. The Ocean King is a known inhabitant of that particular patch of water, but the world in which Phantom Hourglass takes place, is by no means concretely shown to be a “normal” area of sea. A good point is raised about the man who appears to be from the Anouki tribe. However, the Isle of Frost may not be the only home for the Anouki. Within Spirit Tracks there are Anouki in the new Hyrule that the game is set in. In the game’s ending, it’s true that fog envelops the group while the final farewells are said, but the conversation about the two distinct worlds begins before the fog appears. The Ocean King assures them that the Ghost Ship will no longer haunt their world, prompting Tetra to ask, “So what is the world that we are in now?” All of this occurs before the fog appears. If only the words spoken while covered in fog are words spoken inside the World of the Ocean King, then these two lines make no sense at all. They are spoken as the fog first begins to encompass the group, meaning by Tanner’s assumptions, they’ve only been in the Ocean King’s world for about three seconds at this point. If all non-fog areas are part of the real world, why would the Ocean King say “The time for you to return to your world is near”, while at that very second, apparently taking them out of their world and into his spirit world? It just doesn’t add up. Likewise the second line simply doesn’t fit with this theory. If they’ve been in real world the entire game, except for the brief moments when surrounded by the assumed spiritual fog, why is there any need to open a door to the real world? Clearly, the game’s ending conversation, and not just the parts involving the mysterious fog, takes place in a world distinctly separated from Link and Tetra’s world. By association, from the first encounter with the Ghost Ship until the awakening upon that very same ship, Link and Tetra were inside a world different from their own: the World of the Ocean King. Tanner’s interpretation regarding why the Ghost Ship is in tact in the game’s ending is an intricate and interesting proposition, but it relies too heavily on speculation, and one false assumption. 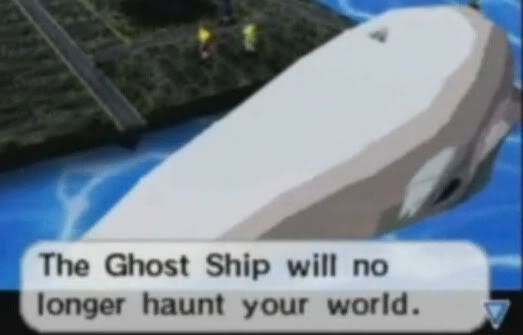 Tanner asserts that the Ghost Ship serving as the focal point between two different worlds met is unlikely, based on the fact that the Ocean King is known outside of the realm of Phantom Hourglass. As I previously brought to light, there is no contradiction in the Ocean King being known outside of his territory. As a deity, he may very well predate the existence of the isles of Phantom Hourglass, and as such, his presence would likely be known through legends. It’s also quite possible that he traveled outside of his territory prior to his imprisonment by Bellum. The Ocean King Reveals that the Ghost Ship is no longer terrorizing the seas. There’s also the question of just who and what made the “time jump”, as well as why such a time jump was necessary. Link and Tetra kept their memories, as well as the Hourglass itself, despite traveling to an earlier time. Linebeck likely kept his memories, lest he should be quite confused about the changes made to his ship. Tetra’s pirate crew, however, did not retain any memories. They apparently only have memories until up to ten minutes after Link and Tetra departed. What of the other people in Phantom Hourglass? Does anything in the game imply that the Ocean King has the power to not only return people to a past time, replacing their past selves, but retaining their future memories, but also to pick and choose which people are affected by it? This seems like quite a creative license on what the powers of the Sand of Hours is capable of. Overall, Tanner makes some very convincing points, but the contrary evidence is just too much. For the islands of Phantom Hourglass to be real, and for a time-travel filled ending, too much speculation is required. Most, if not all, of the indications of Tanner’s theory work just as well, if not better, in the Dreamland theory. Dan’s article draws great parallels to other Zelda games, and certainly the symbolism of memory is quite prominent in the ending of Phantom Hourglass. However, I disagree with the conclusion that similarities to Majora’s Mask outweigh the connections with Link’s Awakening. The people of Koholint Island were very real to Link, so long as the Wind Fish slumbered. Being the product of a dream made them no less a living being than any other person in the world, as the dreams of the Wind Fish were physically manifested. In fact, Koholint too had a “fallen” kingdom. The presence of Kanalet Castle implies that Koholint even had a government set up, until it was overthrown. The reality of existence of the people of Koholint is especially noticeable with Marin. She not only lived and breathed like a normal person, but she longed to be outside the dream, and throughout the game, there are even hints of romance between Link and Marin. As shown by the extra ending achieved if the game is beaten without the loss of a life, Marin even escapes the island to live in the real world. Koholint may have been created by a dream, but it was no less real to Link than Hyrule itself, and as the ending shows, the Wind Fish’s powers extended to conscious creation as well. While we don’t know if the World of the Ocean King ceased to exist upon Link’s exit or not, it was just as eternally lost to him as Koholint was. After Koholint disappeared, Link’s sadness turned to joy at the sight of Marin’s wish being granted. Though the island was gone forever, his memories, and his companion, would live on forever. Likewise, with the disappearance of the Ghost Ship, the only known link to the Ocean King’s World, Link had to face the reality that he had to leave it all behind. However, Linebeck’s presence in the ending, much like Marin’s, consoled Link with the reality that he would always have his memories. The similarities and parallels Ben has proposed are quite correct. However, the situations occurring in the two games are not the same. In Link’s Awakening, Link was trapped in the Wind Fish’s dream, and was able to influence it. However, the game clearly lets the player know that the world is a figment of the Wind Fish’s mind. No such hint is proposed in Phantom Hourglass. Saving the Ocean King is never said to alter or remove the “world”. The Ghost Ship being the transfer point for the real world and the dream does not work, as Link never makes it on the ship, instead, he falls into the waters below. Tetra, the one who actually made it onto the ship, claimed to be dreaming the whole time she had been stone. If we use Link’s Awakening as an example, Link was completely unaware that he was “dreaming” until it was brought to his attention. The biggest flaw, however, is that Link still holds the Phantom Hourglass at the game’s end. In Link’s Awakening, Link retained nothing gained from his adventure. He awoke just as he passed out, floating on his destroyed raft in the middle of the sea. Linebeck is also a strong point. While Marin is speculated to have left the island, all Link saw was a seagull flying away, reminding him of her. However, in Phantom Hourglass, we do not see just a vision, we see Linebeck’s actual boat sail away, in the same state as it was in the game. Link discovers the empty hourglass in his possession. While all the connections between the two games are correct. Link’s Awakening made its plot quite obvious to the player that Koholint was an illusion, and that saving the Wind Fish would end the dream. However, in Phantom Hourglass, no hints are given, no consequences are stated. Leaving me to believe that it was not intended to be viewed that way. The physical items retained at the end would be impossible if the Ocean King’s world was only mystical in nature. In the end the parallels are convincing, but the two situations are introduced and described differently, and should be viewed as such. While I agree with many of the themes Dan has addressed throughout the series, I disagree that the ending is comparable to Majora’s Mask. In Phantom Hourglass, Tetra and Link return 10 minutes after they left at the beginning of the game. So unless the dimension of the Ocean King functions under different laws of time, this should not be. The presence of the Phantom Hourglass is explainable, however, Linebeck’s is not. Why would he be put in a world that was not his own? If he was from Link’s world to begin with, why was he so well known in the Ocean’s King? Unless the Ocean King decided to “banish” him, there is no reason why he was sailing away in the ending. The Hourglass, along with Linebeck did give Link, and the player, the impression that the events did in fact happen, and proved that his memories were something he could trust, even if the situation made little sense. The connections Ben identifies between Phanton Hourglass and Link’s Awakening are certainly valid – I agree that Linebeck and the Ocean King’s roles in the ending correspond to those of Marin and the Wind Fish, and Tetra’s talk about dreaming implies that the theme of dreaming is relevant to this story. I do not feel that these connections necessarily indicate that the whole game was another dream. If this were true, it would mean that the world would end when Link leaves it, but the game does not give me the impression that such an ending is about to take place. I sense that Ciela and the Ocean King must pursue their destinies in one world as Link and Tetra pursue theirs in another – a recurring theme in the series. The spirits tell Link and Linebeck, “We are inhabitants of this world. We must return to the world of the Ocean King! Thanks Link… And you too, Linebeck. Your courage will not be forgotten.” The spirits say they have a world to return to. Link and Linebeck will remember the Ocean King’s world and the Ocean King’s world will remember Link and Linebeck – meaning that the Ocean King’s world will continue to exist. Prior to this discussion, I had not given much thought to the possibility that Phantom Hourglass’s ending implied time travel, as opposed to crossing between dimensions. But the more I considered it, the more it appealed to me. In Twilight Princess, Link returned to the present with an artifact from the past – the Dominion Rod, which had lost its power. This reminds me of Link discovering that he still holds the Phantom Hourglass, though it appears empty after Link leaves the Ocean King’s world. The time travel logic explains this occurrence well enough, and it would place the hourglass alongside the Dominion Rod and The Wind Waker’s Master Sword as a dormant artifact from the past. However, given the sort of technology we see in the Ocean King’s world, the setting does not seem to be presented as a world from the distant past. The steamboat technology and presence of a “twin” like the Prince of Red Lions cause memories of Termina to surface in my mind. I find Tanner’s proposal that the events took place in a far away part of the present world to be plausible enough, but then again, why would the Ghost Ship appear so far away from this place to begin with? Phantom Hourglass: The birth of a legend. Did Link’s journey between the world of the Great Sea and the world of the Ocean King involve dreaming, time travel, or inter-dimensional travel? It isn’t our place to dissuade anyone from believing what he or she feels strongly about in regards to this, but we hope we’ve demonstrated that there are valid enough reasons to believe or disbelieve any of these explanations. The real significance of Phantom Hourglass’s ending boils down to which of these explanations is the correct one. What is clear about the ending is that it draws inspiration from the variety of games that came before it in the series. We don’t really need to determine which of these games is the closest parallel because Phantom Hourglass’s ending is, all things considered, a statement expressing what The Legend of Zelda as a whole is about. Just watch this television ad for Spirit Tracks. A boy gets on the metro train and is somehow transported to a different world. What is the nature of this strange new world? Is it a dream, a different time, or a different universe entirely? How will he remember it when he leaves it behind? Will he share the story of this world with others, and will they believe him? The Zelda games are about legends, and it is the nature of a legend to be mysterious and unverifiable. We choose whether or not to believe them. At the start of the game, Tetra is scoffing at stories of the Ocean King, but in the end she is the one begging her companions to believe them. The ending of Phantom Hourglass has us witnessing the birth of a legend, and that is what we ought to take away from it.